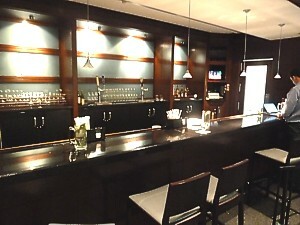 Alcoholic beverages are not served currently in the Boston US Airways Club. 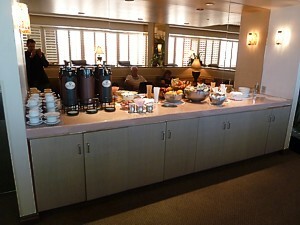 US Airways of course hasn't missed out on the airport lounge bonanza, and operates them at 13 airports across the US. Called the US Airways Club, they are pretty basic clubs, but always slightly above the level of United's Red Carpet Clubs. 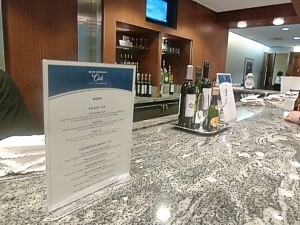 There is however little food in the US Airways clubs, and you'll generally have to pay (or at least tip) at the bar. Access is generally via a paid membership scheme, with reductions according to status in US Airways frequent flyer scheme Divident Miles (or free at the highest tier). You can also buy a day pass, which is valid for 24 hours from the time of redemption, so you can visit the lounge at your arrival airport. It is much cheaper to buy a day pass when you buy your ticket, rather than on the door. There is no access with a domestic First Class ticket however you can gain access with Star Alliance Gold status, even on a purely domestic itinerary. As a Star Alliance Gold you can also gain access to the United Red Carpet Clubs, so long as you are not Gold with United or US Airways. In the past US Airways used to also have Clubs at locations outside the US, and special club in the US for international passengers at Philadelphia. 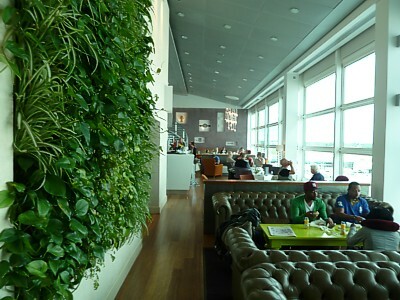 Called the Envoy lounge, it was decidedly upmarket with quite good food. 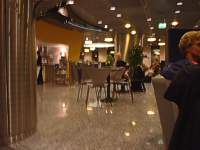 It was reserved exclusively for international business or first class passengers and Star Alliance Gold members travelling on long-haul international flights. 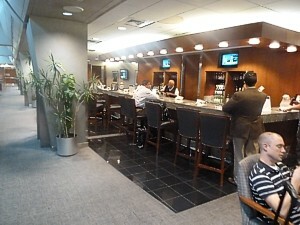 It has now been converted to a standard US Airways Club. Equally, the US Airways Club at London Gatwick has now closed, and instead US Airways hands out invites to the excellent Gatwick No. 1 Lounge. US Airways has clubs at Boston, Buffalo, Charlotte (two), Greensboro, Hartford, Los Angeles, New York (LaGuardia), Philadelphia (two, plus one more in International), Phoenix (three), Pittsburgh, Raleigh-Durham, Tampa, and Washington, DC (Reagan National). There are two US Airways Clubs at Philadelphia: a large one at the junction of the main concourses, and a special one for International flights in the A concourse. Either way, they are vastly better the and United Red Carpet club in Philadelphia. 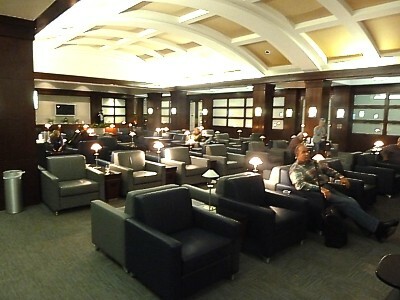 If you have a choice (and Star Alliance Gold) always choose the US Airways Club. Don't forget that at Philly you can use the US Airways "FastPath", a new complimentary service for passengers between Philadelphia and Boston in all classes of service. Perks include dedicated check-in lines, priority security lane (shared with First Class, Envoy, Dividend Miles Preferred and Star Alliance Gold members), departure gates located closest to security, and the first and closest baggage carousel. Just follow the green "FastPath" signs at the checkin. 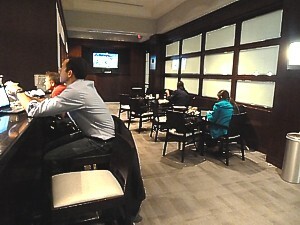 The main US Airways Club in Philadelphia for Domestic flights is that above the B/C Concourse. 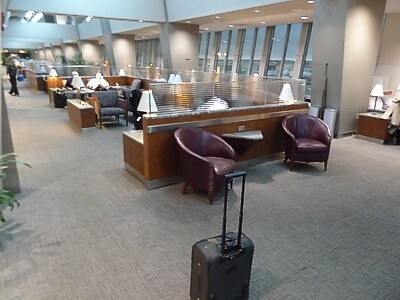 To find it head to the main Philadelphia marketplace with all the eateries between gate 18 and gate 1, then take the escalator beside the windows, double back on yourself, and there is a big long reception desk, which leads onto the righthand half of the lounge. There is also a life behind the Dunkin Donuts at the entrance to B. The lounge itself is a delight: vastly better than most other Clubs in the US (and indeed, knocking socks off the PHL Red Carpet Club) it is big, bright, airy, recently renovated, and with a great view of the gates on one side, and the marketplace on the other. If anything, it proves US Airways can do it, if it tries. All along the floor under the big A frame of the roof there are seating areas divided by big glass screens, with low down coffee tables and dainty little lamps. It is a place of subdued hush, and miles away from the anacky down by the gates or the 60s horrors of the D concourse. Finding somewhere to sit is generally not a problem, although getting a prized seat near the windows is harder. There is of course a small bar, halfway along the Club. 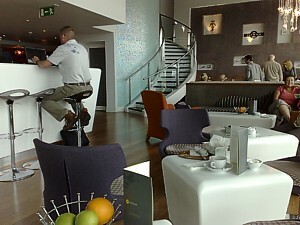 It is very pleasant too, with plenty of stools to sit on at the bar, and watch the two small TV screens above the bar. Alas local licensing laws mean that the bar has to charge a minimum of US$1 – and of course there is the mandatory tip too – but somehow you don't mind that (too) much in this place. There is a selection of six local beers, including of course Bud and Corona, and cheap house spirits, or you can fork out for the premium stuff, including little bottles of Sparkling Wine. Food however is a disappointment. There is just a small food counter, which has apples, biscuits, and nuts. And that's it. However in the evening there is a small menu on the bar counter, which some more substantial fare, so long as you pay for it. There are a few magazines, and local newspapers in a rack by the food bar, but that's it for entertainment, other than the two TVs above the bar. There is free wifi, and a work area with six rather slow computers, and what is called a PrintPod, where you have to pay for the printer. Another big lounge, and one of the best at the airport, although this has been downgraded from an Envoy lounge to just a US Airways Club. Its big and long, a good 140 meters long, spread over both the west and east wings of Terminal A. 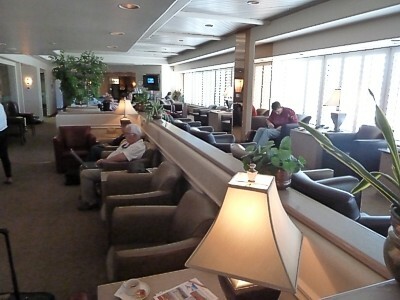 There is a great view over the gates, and a small quiet area at the far end of the lounge. 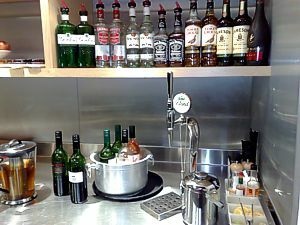 The bar here is much better than in the domestic lounge, with a decent range of drinks, although the bar is staffed: there is no such thing as a walk up free pour bar here. Food is however still poor, with half a dozen trays laid out in the evening, with only salad, cheese, ham, and rolls, plus the usual dips with carrots and celery and dipping sauces. When you are stuck out in Pheonix, it's good to know there are a couple of US Airways clubs here, although both of them are small, and both of them have very little food: if you are hungry, there are the usual food courts around the airport offering all you could want – if all you want is diabetes. The lounge is small, but not nearly as small as the gate A19 lounge, and it has extra perks such as a conference room and a separate TV room, plus a larger bar. There is a pretty good view of the gates. It was rebuild recently, and is fairly nicely appointed, with a plush new carpet and larger square chairs. There are some big screen TVs on the wall, including a big one that's often on very loud next to the bar at the far end. This is the usual free bar (but you must leave a tip) or $7 for spirits. This is a much smaller club than that above gates A7, and it lacks the conference rooms. This is a really tiny lounge, and even getting to it is a bit of a struggle. Find the stairwell next to the Roadhouse burger bar (or take the lift) up to the top floor: there on the balcony overlooking gate A19 is a large model Airbus, behind which is the door for the club: press the buzzer, and you'll be let in by the very friendly staff. You can pretty much see the whole lounge when you walk in, with 40 chairs, separated by the divider in the middle of the lounge, and with the bar at the far end. It's cosy, but in a good way, with a good view over the gates, and with plenty of small table lamps and pot plants to keep the atmosphere up. Alas it is so cosy, that finding somewhere to sit at peak times can be a problem, particularly as people like to sprawl over three of four seats. At the far end is the ting bar with all of three bar stools: people rarely sit here, as there isn't even a TV above the bar. Basic house wine and beer (Bud or Bud light) is free (but you must leave a $1 tip) however if you want anything better, its $7 for something from the premium selection, including dainty little bottles of champers. There is also a small coffee machine next to the bar: take a sachet from the rack, pop it into the slot, and press the button. There are real china mugs, or paper ones if you want to take your coffee onto the plane. Food is poor, really poor, with just apples, crisps, and small packets of busiscuits. Business Facilities Are really quite odd. Up at the far end is a small cave like area, with four small 1930s style workstations, but without computers. 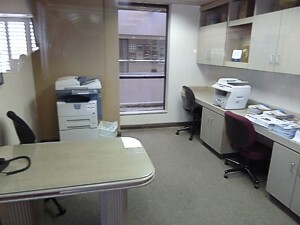 There is also a small office in the lounge which deals with rebooking enquiries, but there are no conference rooms. There is free, slow, wifi. There are two US Airways Clubs at Charlotte, however almost everyone makes for the main one at the intersection of C and D concourses. The one in Concourse B is through security, between gates 3 and 5, but it is quite tiny. Think of the US Airways Club Charlotte, and most visitors think of Byzantine domes, classical columns, and of rushing out to the food court to get something to eat. The architecture is good, the facilities anything but. To find the lounge take the small hidden black marble corridor to the side of the intersection of the C and D concourses, at the end of which is the reception desk. Then you enter a large windowless room with a barrel vault room, plenty of dark wood panels, grey leather armchairms and small table lamps. Down a further corridor is the classical pièce de résistance, a perfectly circular room with a classical byzantine dome, supported by huge double Corinthian wooden columns. The Romanesque ribbed inner core is modelled on the Pantheon in Rome. It looks genuinely inspiring, and is a very pleasant place to sit, surrounded as it is by large glass walls that overlook most of the airport. The chairs are however rather manky, grey leather things with a dull carpet, and low coffee tables. The bar is a bit of a funny one. It is in a small little side room, off the barrel vault room. It really isn't very good, small, with grumpy staff, and a large TV screen at the far end playing sport at loud volume. There is however free been on draft (Bud and Miller) or you can pay US$7 for ‘premium' beer and sprits. House wine is also free. Food is exceptionally poor, with just apples, bags of crisps, and small biscuits. Many people nip out to the food court, and bring in their own food. Similarly newspapers are pretty much non-existent, and the only magazines are US Airways own inflight magazines. There is free wifi, but you have to ask at reception for a card with the code. 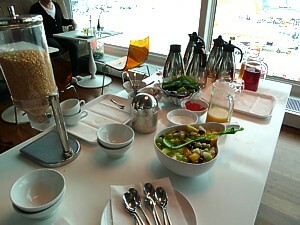 At London Heathrow, US Airways use the brand new Joint Star Alliance lounge in Terminal 1. It is after security, and then you walk right through the shops, and right again into the main square: the lounge is hidden in the corner, to the right of WHSmiths. 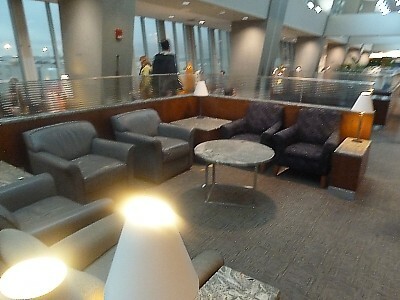 The lounge is very large, but rather dull. Food is pretty good, with a hot option available for the US Airways flight so you can eat in the lounge before getting on board. Food is often curry, with salads and sandwiches also available. The US Airways Club London Gatwick no longer exists: it was closed down when one of the two daily flights moved to London Heathrow. However, all is not lost, because US Airways now use the excellent No1 Lounge Gatwick South Terminal, which is excellent, and far better than the old pokey US Airways Gatwick Club, which was up on the 5th floor above Harrods. When you check in at Zone J, make sure you ask for a lounge access voucher - you won't get in without one, becuase this is of course a contract lounge. If you don't, you'll get stung for the £25 entrance fee (Star Alliance Gold Card holders receive discounted access). It also contains directions, which are pretty important. The signs directing you to the lounge are pretty confusing: you go into the entrance by Harrods, take what seems like a service lift to a dingy corridor, past the V Room, around three sides of a rectangle, and along a corridor, where there is the entrance with sliding glass doors. Or you can do what everyone else does, and just take the stairs by Frankie & Bennies. The London Gatwick No 1 Lounge is always busy - really busy - and it is now used as the lounge for TAP Portugal and and Aer Lingus as well. 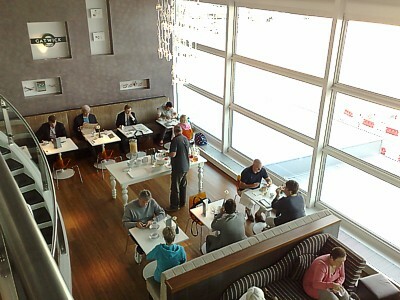 Opened in April 2009 it is chic relaxing place to call into, with huge floor to ceiling windows. 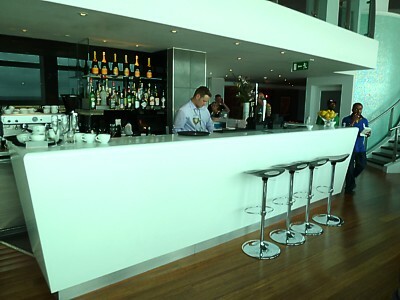 When you are arrive there is a reception on the right, which flows into the bar area. There are bar stools here, but it really is the worst place to sit in the lounge. Further around is the famous indoor green wall. To the left of reception is the dining area, and a table football machine. Up the spiral stairs is a VIP room, a viewing balcony, computers, and the hairdressing, massage, manicure and shower facilities no less. With all the people, it can be a bit chaotic getting served at the bar, however it is well worth while, as there are free cold drinks, wines, beers and spirits (do not tip), although the wine is pretty basic stuff straight out of Tesco, while the beer is standard Stella or Carlsberg. If you want to splash out, No1 Gatwick is more than happy to take even more of your money, and Sparkling Wine (Verve is the Champers of the moment) plus cocktails are available for purchase. Food is equally rather hard to get hold of, particularly in the morning for the flights to Charlotte. There are menus on the tables, and you can order everything from Eggs Benedict to a full cooked English. It's good to see that tea comes in a proper pot as well, and there is a coffee machine on the bar. However it takes so long to get served, most people go for the continental breakfast which is on offer at the dining table by the window. The fruit salad is particularly good. LAter in the day the complimentary food offering includes cakes, savoury snacks and fresh fruit, with light bistro-style dishes available to order. The menus are on the table, and the curry is particularly good. Finally, when it comes to get on the US Airways flight from London Gatwick to Charlotte, there is only one departure screen, above the main reception desk. Remember that US Airways doesn't have its own gates, and the centre pier (Gates 14 - 25) that US Airways commonly use are quite a long walk away. 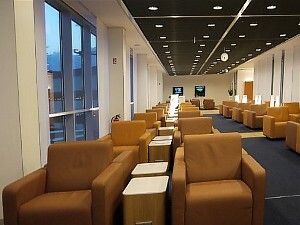 For the regular US Airways flights to Frankfurt, the airline uses the Lufthansa lounges. This can get confusing: you will almost always be directed to the Lufthansa Business Class lounge. Oddly, this isn't the best lounge. 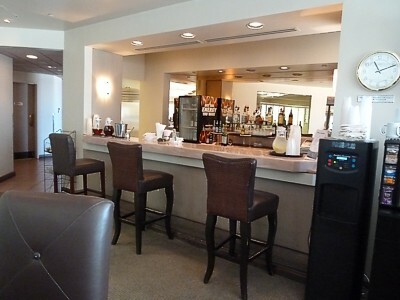 Instead if you are Gold Star Alliance (US Airways Dividend Miles Gold or above) you can use the Senator lounge. 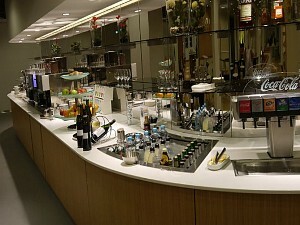 However if you have just a normal club membership, or just a Business Class (Envoy) ticket, you'll be stuck with the Envoy lounge by Gate 4-13 in Concourse C.
At Frankfurt, remote stands are sometimes used by US Airways, and this involves a sometimes lengthy bus ride once you're off the plane. The lounges can be quite a hike from the gates, and they don't always announce departures, so watch those monitors carefully and give yourself a little extra time to make your boarding. Full details of both the US Airways Club Frankfurt lounges are contained in the Lufthansa pages, under the Frankfurt Lounge section. 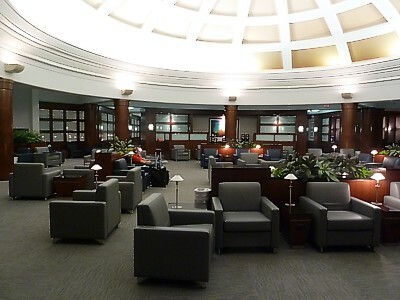 The large new lounge has only just opened, and is a vast improvement on what went before. There are the usual large armchairs, with small tables between (which also have power sockets).Oddly, you can access it either with a First Class ticket, or in Economy as a Gold Star Alliance, but not on a business class ticket. 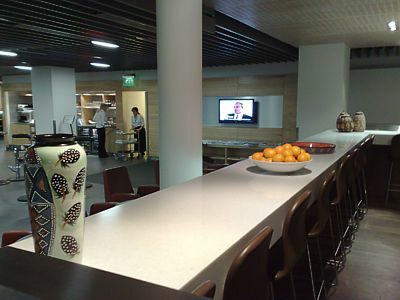 Full details of the Frankfurt Senator lounge is contained in the Lufthansa pages, under the Frankfurt Lounge section. The US Airways Business Class lounges in Frankfurt is in the central part of both rotundra in pier B, reached by the spiral staircase right next to the gates. Full details of the Frankfurt US Airways Business Class lounge is contained in the Lufthansa pages, under the Frankfurt Lounge section.